Has your fine jewelry seen better days? Why not bring your cherished pieces to Steven DiFranco Jewelers, where our expert jewelers will make them look as good as new. 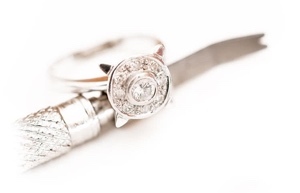 We have the most sophisticated jewelry repair and manufacturing shop in Northeast Ohio right in our store! Our four in house jewelers will treat your jewelry as if it was their own Mothers and make it beautiful, just like it once was. Is your favorite chain broken, or are the prongs on your engagement ring wearing thin? Perhaps your ring is a bit too loose and needs to be sized. Or your white gold ring is looking dull and can use some fresh rhodium plating. Ask us about our Pit Stop Lightning® Fast jewelry repair service!